Creekside Welding was established in 1999. 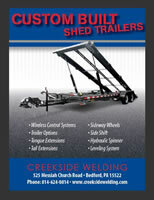 Creekside Welding and Jamar Trailers primarily builds storage shed trailers and gazebo trailers. Occasionally they do local repairs for farmers etc. Creekside Welding and Jamar Trailers is owned and operated by James Peight Currently James does all fabrication by himself. James takes your design and fabricates your trailer according to your specs. James spent several years delivering storage sheds in the local area. He experienced the frustrations of storage shed hauling and knows how shed trailers should work. James believes in honest hard work and aims to satisfy his customers to the best of his abilities. Jamar Trailers offers prompt and highly customized service. Trailers are built from quality materials. In the event of defective materials or workmanship, we will stand behind our product.